With immense production value from the costumes and lighting to songs and choreography, The Greatest Showman has it all and does it exceptionally well. Looking for a film to feed your musical sensibilities and soul that will also keep the younger "Mouseketeers" at your side engaged and entertained? Look no further than the circus! Socialites and royalty mingling with "freaks;" contemporary dance moves in period costumes; 20th Century dialogue and song from 19th Century characters...vivid colors and chiaroscuro lighting. A future film class case study on juxtaposition, The Greatest Showman (20th Century Fox Home Entertainment) would make both Kuleshov and P.T. Barnum, himself, proud as presented on 4K, Blu-ray, and DVD this week. For the sake of entertainment and [ahem] inspiration, set aside is the controversial debate on whether Barnum was a social justice dreamer empowering outsiders, labeled "freaks" or "curses," previously relegated to the shadows; or, a con man exploiting the "special" people on which he was purportedly shining the spotlight. Decidedly leaving the latter in the coffers, the former can be embraced as it is leveraged to create a film with the precisely executed intention of entertaining, inspiring, celebrating, and embracing that which makes us each different...and spectacular (with a killer soundtrack to boot). The original "reality" showman, Phineas T. Barnum (as both storied, and charismatically portrayed by Hugh Jackman; Wolverine) is a visionary with a flair for captivating the attention and imagination of the masses. (After one unimpressed critic disparages Barnum's showcase as a "circus," he adopts the word and incorporates it into the title; hence, P.T. Barnum Circus.) It is, however, the ever elusive societal acceptance, and "respect" that comes with it that would fuel his drive; and, in turn, create a chasm distancing those he most professed to treasure. The son of a poor tailor (Will Swenson; No Tomorrow), he is denigrated at the hands of a wealthy patron (Fred Lehne; Money) whose daughter (Charity) he befriends, and ultimately marries. This, and further humiliations upon the death of his father are the seeds that feed his feelings of inferiority, and lifelong lust to prove his worth. Michelle Williams (Wonderstruck) is enchanting as Charity Barnum whether onscreen alone ("Tightrope"), opposite Jackman ("A Million Dreams"), or alongside (delightfully endearing) daughters Caroline (Austyn Johnson; The Post) and Helen (Cameron Seely; The Jim Gaffigan Show). Equally charming and talented are the portrayers of Young Barnum (Ellis Rubin; Linda from HR), and Young Charity (Skylar Dunn; OITNB). Williams' performance is breathtaking in that she emits a strength in character, and fortitude in life swathed in demure elegance. The rooftop scenes rekindle feelings of vintage romance for modern times as evoked by Baz Luhrmann's Moulin Rouge. Meanwhile the crew of misfits that comprise the circus closely resemble Luhrmann's band of misfits working on "Spectacular, Spectacular"; they are spectacularly talented and mesmerizing in their own right. Watching The Greatest Showman in its soon to be released digital version(s), 4K and Blu-ray provides an enhanced visual experience that augments the subtlest of details, intensifies the lighting (including intensified shadow for added dramatization), and refines the color saturation for truer, more vibrant hues. In his feature length directorial debut, Michael Gracey has managed to produce a visually stimulating film that brings together period story, setting and costumes with contemporary music and dance moves. It might sound cringingly hokey, but it actually works; equally entertaining for the more sophisticated musical lover, and the High School Musical set. The sound is also superb in both the Blu-ray DTS-HD Master Audio 7.1 and 4K Dolby Atmos. Whether the dialogue or the score, from the ambient sound to the crackling of the fire, the crispness, clarity, and invoked emotion of the sound truly make the experience more memorable...even if you are assured to walk away with an earworm or two. An old-school film student, I honestly don't fully understand all the technical specifications in detail. I am, however, able to recognize and beautifully experience all of it as will you. Equally impressive are the extras included in this combo pack. 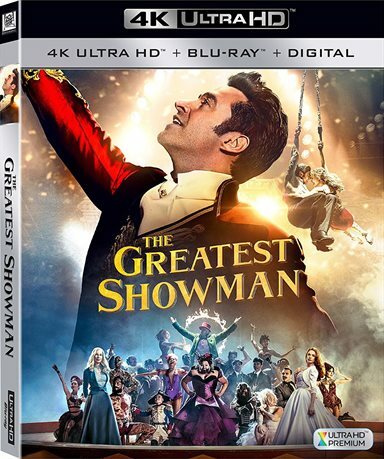 Housed on the Blu-ray they are: The Family Behind The Greatest Showman, The Songs, The Spectacle, Galleries, Concept Art, Storyboards, Music Machine, Sing Along, Audio Commentary by Michael Gracey and Theatrical Trailers. The first is a nice 15-minute foray into what it took to bring this movie to life and offers lots of behind the scenes footage of rehearsals and cast interviews and the Singalong is a must for any musical theater geek or family viewing that includes young children. Download The Greatest Showman from the iTunes Store in Digial HD. For more information about The Greatest Showman visit the FlickDirect Movie Database.